I am pretty sure that I say this every year, but I LOVE Christmas. It is my most favorite time of the year. I love the pretty colors and decorations and, if I liked gingerbread cookies, I am SURE I would also love the smell of baked gingerbread cookies! There is something about ginger that just doesn’t sit well with my taste buds… Yesterday, I made a green juice and the recipe asked for ginger. So, I did what any person who doesn’t like a certain ingredient does – I halved the quantity. Well. Let me just say. I should have just left it out completely. I had to hold my nose to drink the stuff! But we are getting away from the real reason we are here today: to take a sneak peek at my Christmas Preschool Centers and to give you a few freebies to help you decide whether this is something you would like to use in your classroom or home! First up, is a Christmas tree fine motor activity. I use red and green buttons for this, but you could use any small objects: pom-poms, gems, bells, baubles, pebbles, playdough formed into balls! 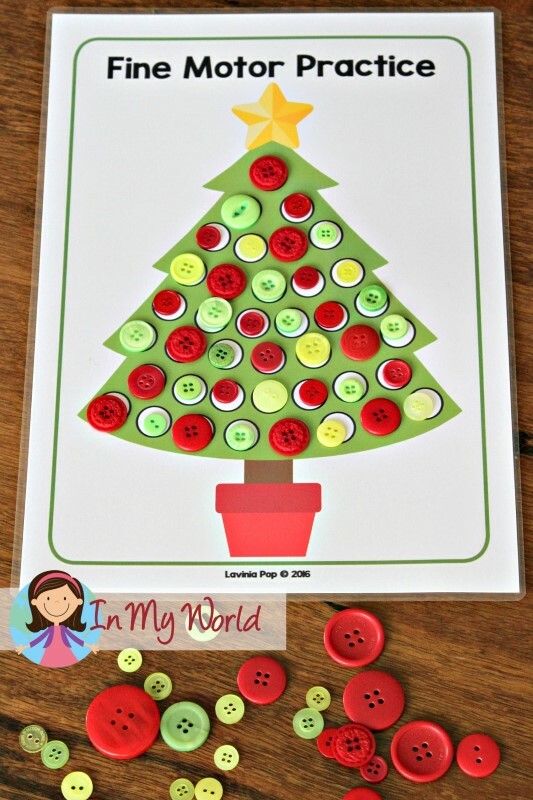 Another activity turned fine motor is the Christmas tree color sorting activity. You could sort anything to the differently colored trees (buttons, tinsel, baubles, beads, bows, to name a few), but I decided to use sequins. I also added a Christmas ornament tracing activity for both upper and lower case letters. You could make a write and wipe tracing booklet with them by making a hole at the top of each ornament and securing them together with a key ring. It’s definitely a fun way to practice correct letter formation during the season! But, there are so many other uses for these alphabet ornaments! You could have children match upper and lower case letters, put them in alphabetical order, spell out sight words or children’s names and then display them around the room or on your Christmas tree. You could even make a “Merry Christmas” or “Happy Holidays” banner. Next up is Santa’s sack of Christmas presents. You could have your children match the lower case letter to the upper case letter, but if they are ready for beginning sounds, you can add in that component too! I used a hot glue gun to glue the presents on to some clothes pegs, but you could also use velcro dots. 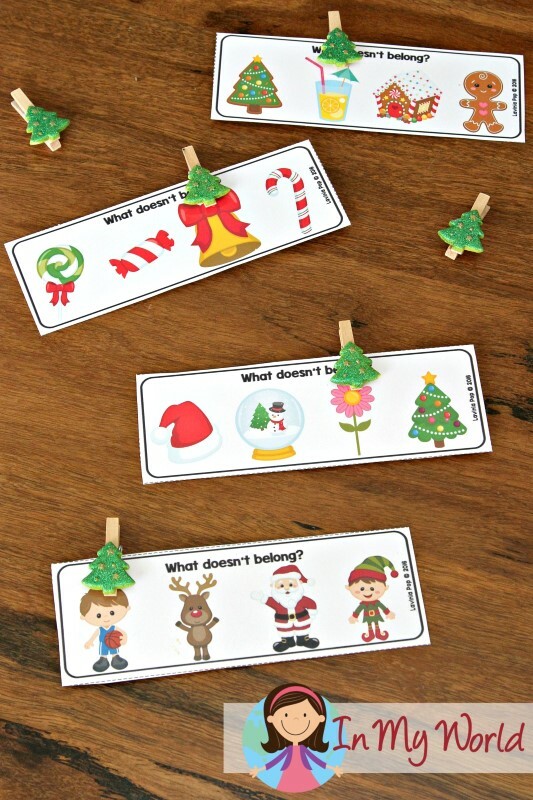 Because sight words are taught at such a young age (in some places), I added a Christmas tree sight words activity to the packet. You don’t need to prep it the way I did, but I like to incorporate fine motor components in activities if I can. To prepare this activity, I firstly laminated and cut everything out. Then, I attached 4 small wooden clothes pegs to a rather large popsicle stick that I bought from a craft store. I put some hot glue on the bottom peg and then glued on the base of the tree, making sure that it was center to the popsicle stick. 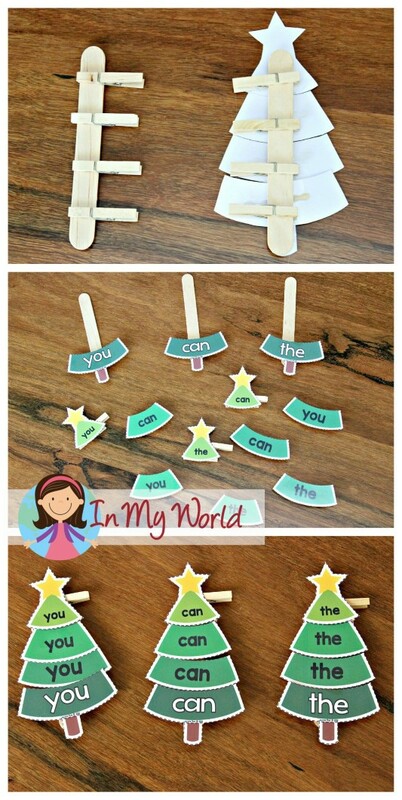 You do this for the remaining sections, always making sure that they are center to the popsicle stick. Whatever you do, do not, and I repeat, DO NOT, just assume that you will magically center the Christmas tree sections correctly without doing what I said above. I made that horrible mistake and only realized once I had hot glued ALL THE SECTIONS on to the pegs. Next up, is gingerbread people counting. You could have your children put them in order, or count out objects for each ginger person. As with the gingerbread people, you could put the Christmas trees below in order, or count out objects to put on them. 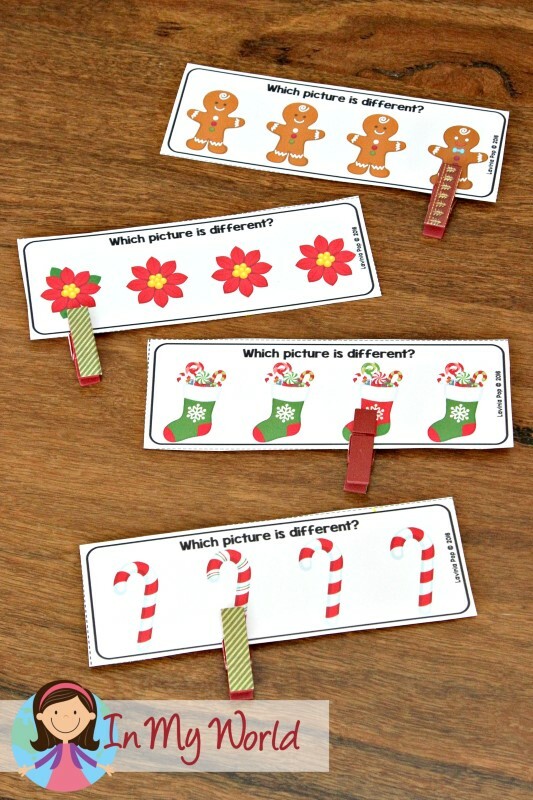 Next up, is a Christmas tree ornament number sorting activity. Depending on the level of your children, you can select with baubles to use. I have also included a shape matching activity that requires children to match the reindeer head to the correct present. I know that it is kinda weird because, honestly, who would wrap a reindeer head for Christmas?! But, I am sure your kiddos won’t mind. And if you think they will be upset by the idea of wrapping Rudolph for a present, you could always ask them to sort differently shaped objects, like buttons, to the presents. I have also included a “Which picture is different?” activity. I have also included a “What doesn’t belong?” activity. 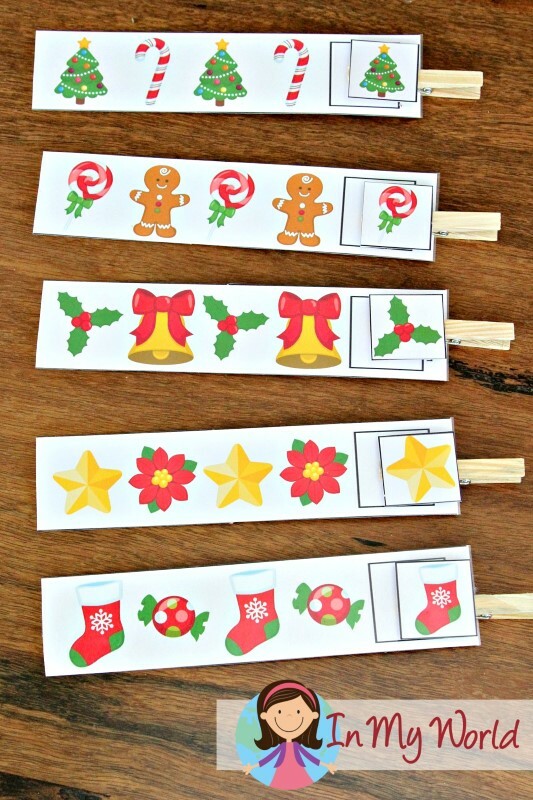 And a Christmas patterns activity. Well, that’s all that I have included in my Christmas Preschool Centers packet. If you like the look of these, and would like to purchase the entire packet, it is available here or you can get it by clicking the picture below. 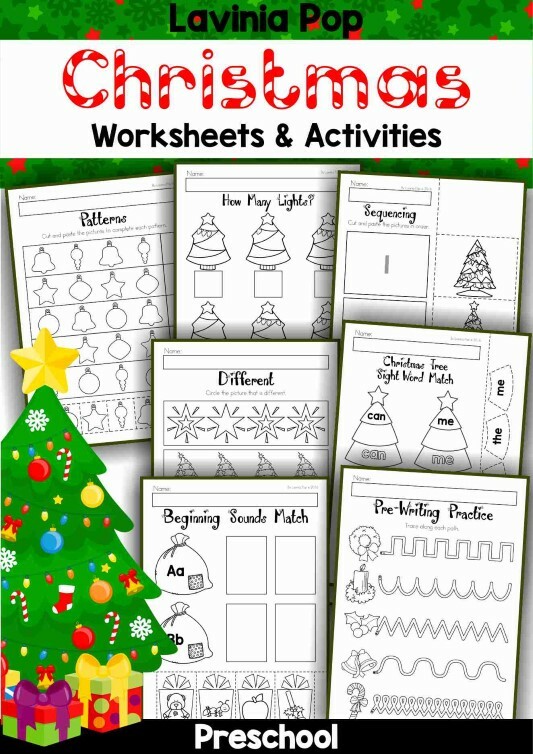 If this is too much prepping for you and don’t like the idea of using so much ink, please check out my Christmas Preschool Worksheets and Activities by clicking here on on the picture below. ALSO!! Did you know that I am having a SALE?!? 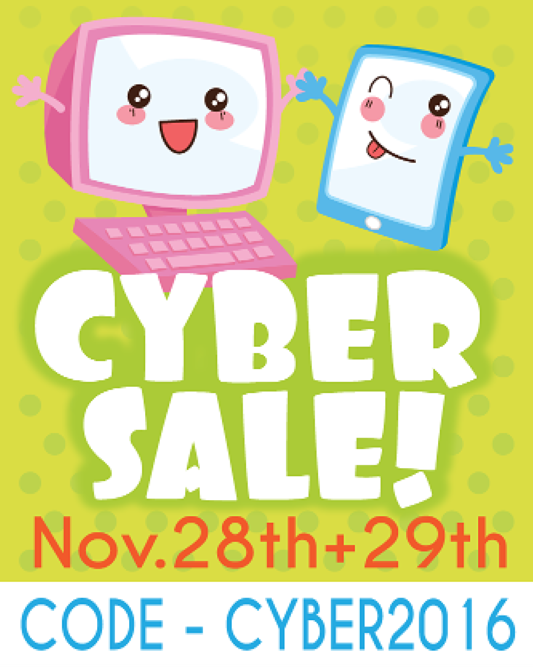 Enter code CYBER2016 at checkout to receive 28% off EVERYTHING in my store! The sale ends on November 29th, so please be quick! These make my heart happy! Wonderful creations. I love these centers! Thanks so much for the time and effort you put into these. These were exactly what I needed. Thank you. I love your activities! Do you have them in Spanish? I’m sorry Cassie, but I only have them available in English. Your website on Children’s learning is the best I have seen. I will pass this on to my sister who is a teacher and hope she will use your ideas. Thank you. do you also have only the lower case letters? Would you be able to tell me what font you used for the ornament tracing activity? I see 1 to 5… do you have 5 to 10 too of all these packs?